Thank you to Squarespace for sponsoring this post. 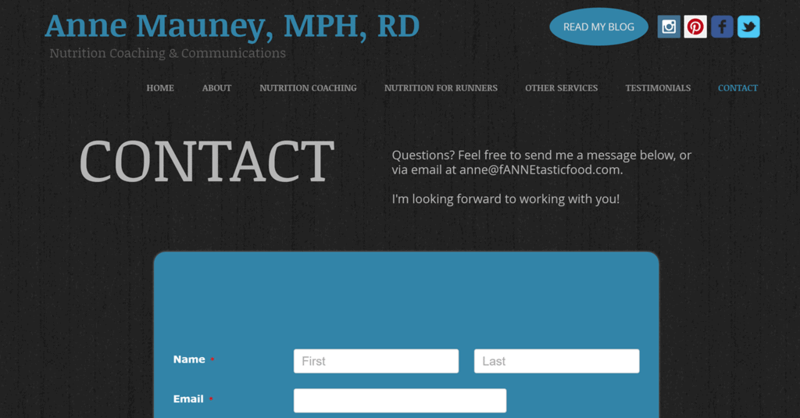 One of the questions I get the most via email, after how to become a Registered Dietitian, is how to create a website. It seems many of you want to build a website to showcase your business/service offerings, but don’t think that you can do it without design or coding experience. But here’s the thing: I have no idea how to do any of that stuff either, which is why I’m all about finding tools that make creating a website without design or tech skills simple. Enter: Squarespace. 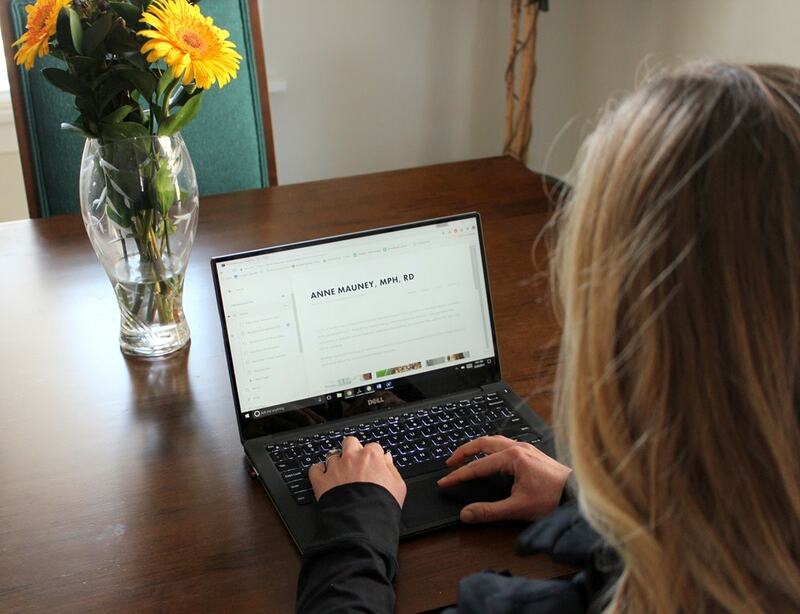 When Squarespace reached out to me about a review, the timing was perfect because I was already planning an overhaul/redesign of my AnneTheRD nutrition coaching & communications business website. I built that site back in 2013 just before launching my private practice, and while it has worked well for me over the years, the time had come to update it with a more polished and professional look. So, I was excited to try out Squarespace, which is a creative tools company that helps you build websites and stores! Basically, it makes great design accessible to everyone with no html, coding, or design skills necessary. You can change templates anytime you want without having to rebuild your whole site (something my old website builder doesn’t offer) – they will just auto-convert all your content to fit into the new template. You can also “preview” what your site will look like with a new template. Love this! All the templates are built to be mobile responsive automatically (again, something my old website builder doesn’t offer, which was a problem since everyone looks at websites on their phones nowadays and mine was a mess). Unlike many of their competitors, Squarespace has an award-winning customer care team that serves customers 24/7 via email and live chat. Always good to know help is there if you need it. It’s an all-in-one platform that removes all of the headaches of installing software, applying security patches, and worrying about bandwidth or storage limitations. The templates are all designed by professional designers, making it much easier to create a professional, clean-looking site. Given all that, I decided it made sense to give the redesign a shot myself via Squarespace rather than hiring someone else (at great cost) to do it for me! Plus, I really like having the ability make changes to my own website as I want, rather than having to email the designer, wait for them to change it (and probably charge you for it), etc. I especially loved how you can edit photos right in their system – saves the extra step of having to resize and crop before uploading! It was actually pretty fun to play around with all of it and get my website looking just the way I wanted. I also took the opportunity to rework some of the text and page organization for my nutrition coaching packages and other offerings. In addition to a new look and feel, the content definitely needed some updates, too. Good excuse to finally do that! Honestly, I wish I’d created my original AnneTheRD website on Squarespace – it was so simple to use and I love the new look and feel I was easily able to give the site. I was also super impressed with their live chat support – I had some design questions for simple tweaks I wanted to make to the site and couldn’t figure out on my own, and the live chat operator was so helpful! Saved me a TON of time, and now I know how to do those tweaks myself for the future! Yes!! Like you, I used to also use Wix. But once I discovered Squarespace, I couldn’t believe ALL the time I had spent building my website in the first place! I LOVE my Squarespace site. You’re looks beautiful, as well! Yay, so glad you love Squarespace, too! Looks great! :) Don’t forget to fill in your SEO — go to Settings, then SEO to customize! Yay! Let me know how you like it! I definitely found it more user friendly/less cumbersome than Wix! Thanks for the great information! Your new site looks gorgeous. Oh my gosh I just love the Smashing Pumpkins and Garbage reference! I feel like we would have been BFFs ;) Remind me to tell you a funny story about Scott and Smashing Pumpkins when we chat next! What designer/website did you use to create your fannetasticfood website? WordPress? Do you think you will switch this site over to Squarespace? Yes, I created it on WordPress back in 2009! I’m not planning to switch it – having 8 years of content means it would be quite the undertaking. If I started a blog today, though, I’d likely use Squarespace over WordPress because it would be nice to be able to customize it more myself! I have never thought of opening a website since I still enjoy using blog very much. I will consider about it. It seems quite easy. Thank for the information! Sure! I like having a separate business website (rather than having that + the blog in one place), but that’s just me! I am debating between a new WordPress site (I currently have the free version) and something like Squarespace. I am wondering if there is a way to keep route your followers and old blog to Squarespace so I don’t lose any of my posts or followers. Any advice would be helpful! I’m not sure on this – but I bet the Squarespace FAQ or live chat would be able to help you out! Very impressive, Anne. And like the results very much! Do you use Squarespace for this blog page? Or only for the RD business? Just for the RD business website! I started my blog 8 years ago on WordPress so switching would be too much of a pain, and I like WordPress. If I started a blog today, though, I would consider Squarespace because it gives you more ability to easily customize without coding knowledge, I think! Thank you so much! I’ve been following your blog for years. I’m in Northern VA also and I’m a group fitness instructor. I want to start a website/blog promoting my classes and writing about fitness so trying to find out where to get started! Now I’m seriously considering Squarespace per your recommendation :) Thanks!!! !